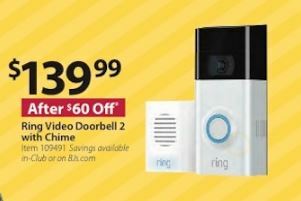 Expect big discounts on the Ring Doorbell for Black Friday 2019 and Cyber Monday from Amazon and other electronics retailers. Pick up a wi-fi enabled video doorbell from Ring to protect your home and enable easy entry to approved guests. We have scoured all of the online and print ads for Thanksgiving weekend including Black Friday and Cyber Monday 2019. Ring is a global home security system owned by Amazon. 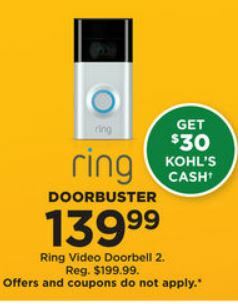 It makes video doorbells that allow you to answer the door via your iOS or Android smart phone. The standard first version with a regular price of $99 is battery powered and works with every home. The next generation Video Doorbell 2 has enhanced video resolution and quick release battery. The regular price is $199. The Pro and Elite versions include advanced security features or a professional grade with flush mounted installation. 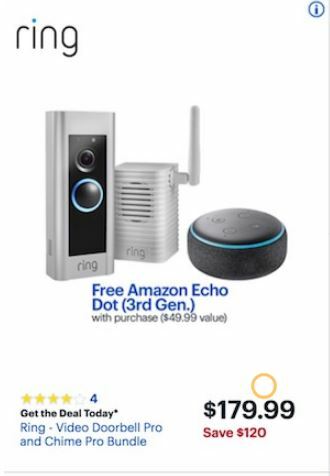 There are still a few months before online retailers and electronics store like Amazon, Best Buy and Walmart begin announcing their discounts on the Ring doorbells. But you can rest assured that we will be posting them here as soon as they do for Thanksgiving Weekend including Black Friday and Cyber Monday 2019.